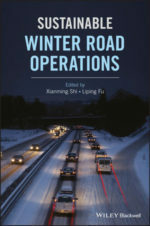 Covering a wide array of topics related to sustainable winter road operations, this textbook is a unique and essential guide to modern winter operations. The text provides an in-depth overview of a number of important topics, including the environmental and economic impacts of winter maintenance, best practices for maintenance and equipment, and an overview of recent research and technological developments. This book is an essential reference for professionals involved in the field, and provides practical guides on how to improve the effectiveness and efficiency of operations as well as how to optimize costs and deal with problems such as corrosion. The text is edited by Xianming Shi and iTSS Director Liping Fu. A number of iTSS members with related research have also contributed to this work, including iTSS alumni Tae J. Kwon, Kamal Hossain, Taimur Usman, and Matthew Muresan. The text is available for purchase through Wiley Publishing here. ⇐ Award of Excellence in Graduate Supervision goes to Dr. Fu!